Its always nice to have your priors confirmed by some systematic data. 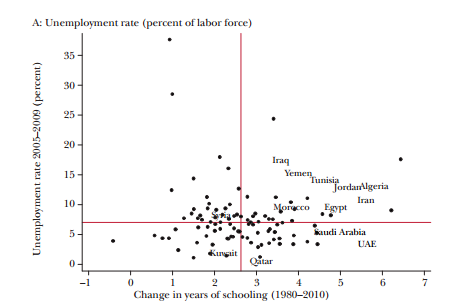 Here is Campante and Chor in the Journal of Economic Perspectives with a nice chart showing that Arab countries do generally have higher than average unemployment and more recent growth in education than other countries. 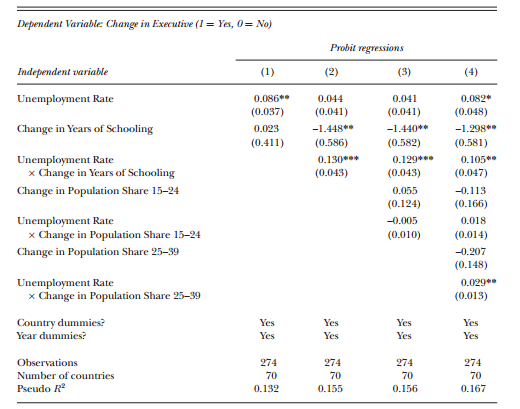 They also find some evidence (correlation is not causation etc) that it is the interaction between unemployment and schooling that has led to political change, and not either by them self. In generous terms, this can be summarised as 'no significant effect,' but that is for a t-test against the null of 'zero'. Conceptually, that's valid for program evaluation, but I wonder if 'zero' is really the relevant counterfactual? Relative to the Millennium Villages program, aid spending can be- is- phenomenally wasteful, and for many of the dollars spent on MVP, Sachs' program represents the 'least worst' use of aid. This isn't a constructive argument in favour of this intervention, of course, but I think it's important to have the relevant counterfactual in mind: would those MVP dollars really have otherwise been spent on DOTS? Reeeeally?